Dumond Chemicals makes its marketing mobile-friendly with this custom-designed smartphone-optimized website by DDA. 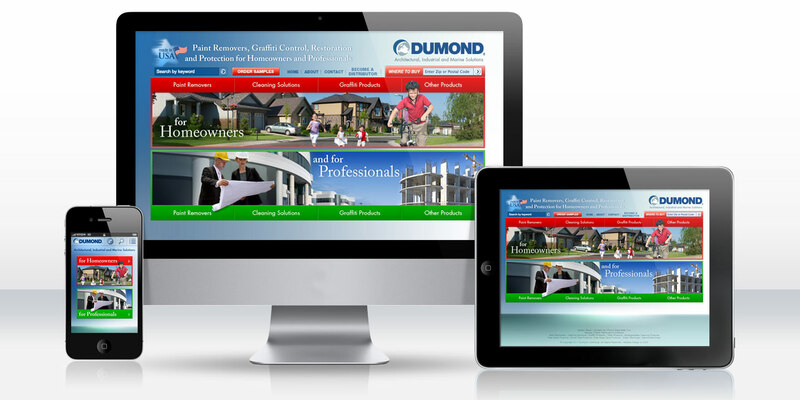 Dumond Chemicals had a great main website optimized for personal computers and tablets, designed and developed by DDA, and wanted to make sure that those visiting the site from a smartphone or other small mobile device would be able to have the same great experience but tailored to smaller screen sizes and optimized for touch-screen navigation. The new website was to include the full gamut of all the unique features of the main desktop/laptop/tablet site, including the word search, the dealer locator, the contact forms for consumers and distributors, the shopping cart for ordering samples, and the complex dealer locator. The website would also include all the detailed information present on the main website so that those visiting from smartphones would be exposed to the same information as those visiting through a personal computer or tablet. DDA took the essential branding and design motifs from the main website and reorganized them for proper presentation on a smartphone. A new menu system and homepage was built out that allowed for easy navigation and intuitive use of the numerous special features to the website. The final smartphone-optimized website was well received and helps Dumond reach a broader online audience, which is increasingly using small mobile devices to access the internet.